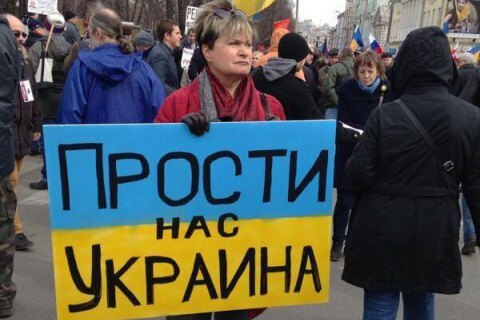 "Forgive us, Ukraine," the poster says. Ukraine is preparing an international lawsuit against Russia for war crimes, the press service of Ukrainian President Petro Poroshenko has said. "He [the president] set the task to prepare documents concerning war crimes. These materials are being collected so that a lawsuit could be prepared to be filed with the international court," it said. In December 2017, Ukraine's permanent representative to the UN, Volodymyr Yelchenko, told the Russian delegation to the UN Security Council that punishment for the crimes committed against Ukraine would inevitable by analogy with the International Court's rulings in the case of Yugoslavia.